Seaton and District Lions Club was chartered in 1985. We serve the small town of Seaton on the south coast of England, together with the neighbouring communities of Axmouth, Beer, Colyford and Colyton — a population of about 13000. We now have 23 members. The highlight of our wide social programme is our Charter Dinner in February. We also have a Christmas Party in December and a variety of social events throughout the year. 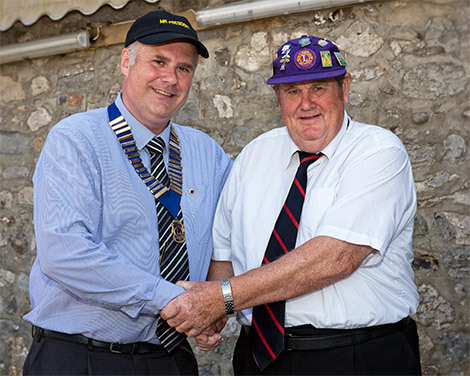 Seaton and District Lions Welcome New President. 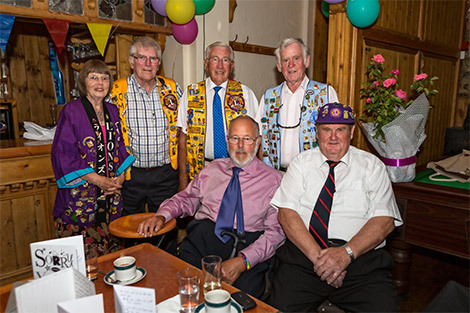 A new President has been welcomed by Seaton and District Lions Club on the first of July. 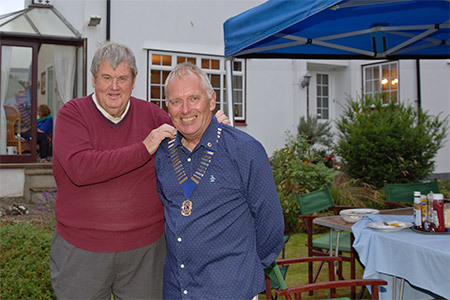 The Presidents chain of office was handed over by the old President, Ian Barradale to the new President Jim Partridge-Hogbin at a special 'handover' dinner at Winston's in Harbour Road. New President Lion Jim Partridge-Hogbin on the left being congratulated by outgoing President Lion Ian Barradale. The handover dinner was a fun occasion with Lions, partners and guests enjoying a humorous speech full of jokes and presentations by the outgoing President. Lion of the year for the second year running, Fred Paulley receiving the trophy from outgoing President Lion Ian Barradale. 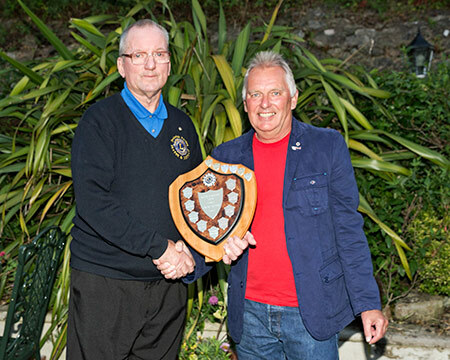 The 'Lion of the Year' shield was presented to Lion Fred Paulley for the second year running for his outstanding service to the Club during the previous 12 months. Outgoing President, Ian Barradale also thanked other Lions who had contributed so much in their work for the Club. New President Lion Jim Partridge-Hogin looked forward to the year ahead saying that although the club had a strong membership of 23, it would need to increase its number of members by 2 or more during the coming months. The event was organised by the Nunsford Nutters Carnival Club. Teams of 5 ( well the Lions had 2-3 more ) Six teams took part and raced around the town centre. On the first lap the teams had to stop at 3 pubs and drink 3 pints of beer at each of the 3 pubs. The 2nd lap went around again without stopping. Seaton Lions came a respectable 4th, well we were the oldest entrants. Seaton & District Lions Club Make Donation Towards New Colyford Defibrillator. At the last meeting of the Seaton & District Lions Club, the Lions handed over a cheque for £900 as a donation towards the new Colyford defibrillator. The cheque was accepted by Colin Pady representing the Colyford Memorial Hall committee who have been raising money to buy the defibrillator. The donation from the Lions has completed the total needed by the Colyford Memorial Hall committee. They can go ahead with ordering the defibrillator which will be installed at the hall in the next few weeks. 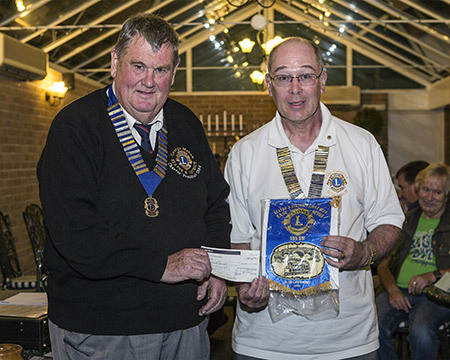 photo shows Colin Pady receiving the cheque for £900 off Lion George Mabon watched by Lion President Ian Barradale. 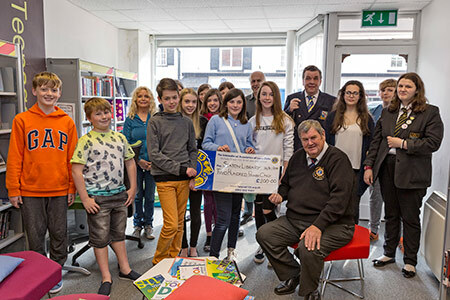 Seaton & District Lions Club give a donation to Seaton Library Teen Zone. The Seaton & District Lions Club recently received an appeal from Librarian Skeoulla Hambi-Hilder for funds to help the Seaton Library Teen Zone. Each Thursday evening from 5pm to 7pm around 20 young people from Seaton go into the Library for the Teen Zone Club. The Teen Zone is run by volunteers and the activities they can take part in range from arts and crafts to cooking. They need to buy card making materials, porcelain pens for painting on mugs, glass paints, tee shirts for printing on and transfer paper. The cooking ingredients they need include for cake and pizza making, grease proof paper, utensils and aprons. The Lions have made a donation of £200 towards buying these materials which will hopefully cover the cost of buying these materials over the next few months. photo shows Lion George Mabon presenting a cheque for £200 to Seaton Library. Seaton & District Lions have a busy Friday! The Seaton & District Lions Club were busy on Friday with two visits to places where they have recently made donations. The first visit was to Rupert's Pre-School to meet the manager Kay Jeffery and the children who attend the Pre-School on a Friday. The Lions recently presented £200 to Rupert's to buy some new activity equipment, a pedal roller and a set of play balance scales. After a short chat with Kay and the Children the Lions went over to the Pink Hippo Pre School. They were welcomed by Debby Hubbard and Sue Amato the managers of Pink Hippo Pre School. Here the Lions had also donated £200 to buy a Maths Counting Keys game, a Maths Outdoor Counting Line, Construction Den Tube Building Kit, an Incy Wincy Spider game and a Construction Nuts and Bolts game. 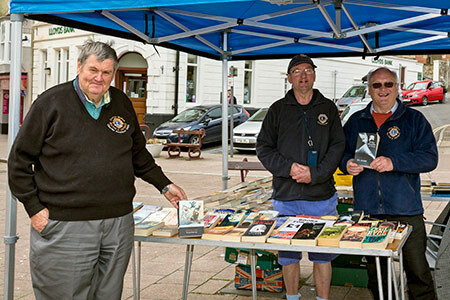 Back in the centre of Seaton the Lions were running their bi-weekly book stall. This bookstall will be held every other Friday throughout the summer selling both new and second hand books. The Lions Friday Bookstall with Lions George Mabon, Fred Pauley and Clive Millman. The books have all been donated to the Lions and the money raised goes towards helping local causes and organisations. The next bookstall will be in the Square in Seaton on Friday 3rd June. Seaton's Young Leaders in Service present cheque to Hospice South West. 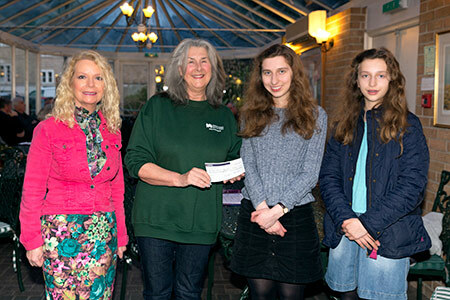 Two of Seaton's Young Leaders, Victoria and Isabella Synek Herd, presented a cheque for £428.20 to Pauline Leach, Children's Hospice South West, at Seaton and District Lions Club April meeting in the Eyre Court Hotel. The Young Leaders raised the money by holding tabletop sales, tuck shop, selling Christmas cards and organising an Easter Egg Tombola. 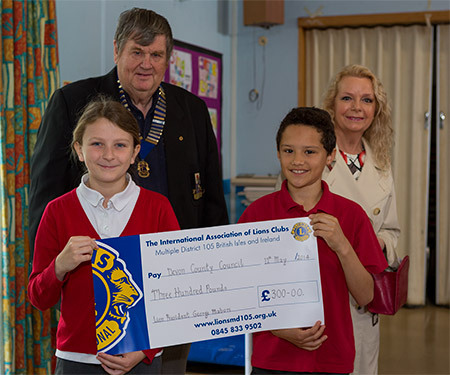 Seaton’s Young Leaders are sponsored by Seaton and District Lions Club independently raising money as Young Leaders in Service to donate to good causes. Seaton’s Young Leaders chose to donate to this charity because the Children’s Hospice Southwest provides hospice care for children with life-limiting conditions who are not expected to survive into adulthood. The three hospices in the south west, provide respite care and support for those children and their families. 2016 is an exciting year for the charity, which celebrates 25 years since its founding in 1991. Seaton & District Lions Club have helping two local groups by giving them much needed donations to their funds. They were recently contacted with appeals to help by the 1st Seaton Guides and the Seaton Youth Football Team. 1st Seaton Guides leader, Jane Johns explained that the Guides were going on a camping trip to Truro, Cornwall at the end of May and needed to raise £800 towards the cost of the coach. 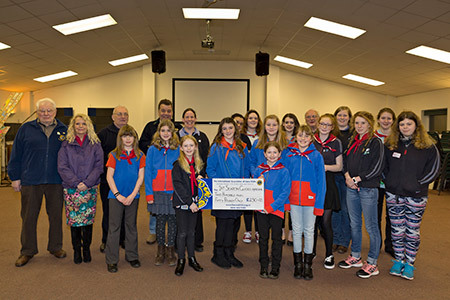 Seaton Lions were pleased to help them reach this target with a donation of £250 towards the cost of the coach.Photo shows members of the Lions presenting their cheque for £250 to the 1st Seaton Guides. For many years Seaton Youth have had cause to be very grateful to Seaton & District Lions who have provided a constant stream of financial support. Seaton Youth Football have 10 teams which they believe to be most there has ever been. They are mixed teams, largely boys but with a few girls, in most age groups between 7 and 16 and two relatively new girls teams at under 16 and 18. The Lions have kindly sponsored what is currently the under 10 team. About 140 young people are now actively involved in the club. Seaton & District Lions Club have further sponsored the club this year with a donation of £250. Paul Grint, Chairman of Seaton Youth, thanked the Lions for their generous donation which would be used to provide much needed equipment for the Club. He added that the Lions were much valued, long standing supporters of Seaton Youth Football. 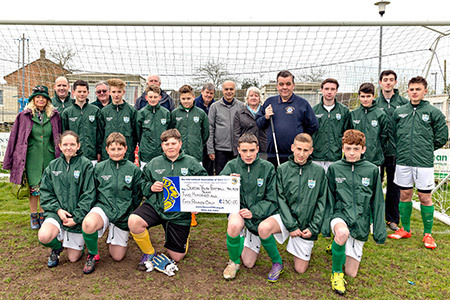 Photo shows members of the Lions Club with Seaton under 14 team before their match on Saturday at which a cheque for £250 was presented to Seaton Youth. Seaton and District Lions Club were marshalling at The 2016 Grizzly race in Seaton. 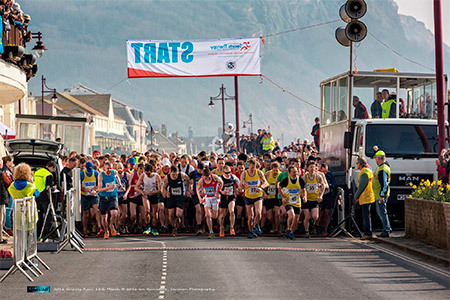 Each year in March, 2,000 runners set off on twentyish muddy, hilly, boggy, beachy miles of the multiest-terrain running experience you will find this side of the end of time. 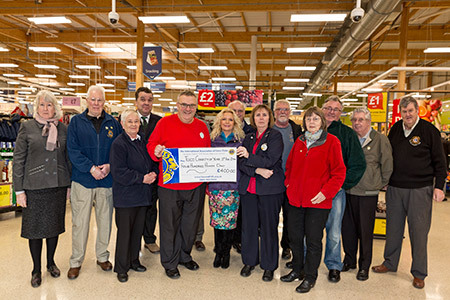 Seaton & District Lions Club have made a donation towards Tesco's Charities of the year, Diabetes and the British Heart Foundation. The Lions raised over £700 collecting outside of Tesco's on Christmas Eve. To say thank you to Tesco's for letting them make this collection the Lions have agreed to present a cheque for £400 to go towards Tesco's two charities of the year. The photo shows the Lions making the presentation to Rhoda and John who received the cheque on behalf of Tesco's. Seaton & District Lions Support Seaton First Responders Team. Seaton and District Lions Club have made a donation of £200 to the Seaton First Responders Team who are part of the Devon and Somerset Fire and Rescue Service. Thanking the Lions, Station Commander Mike Markham told them a bit about the work of the Seaton First Responders Team. The Seaton Team is funded primarily by the South West Ambulance Trust with the remaining funds coming from the Fire Service. They are obliged to attend an emergency call out in under 8 minutes to qualify for this funding. All of their call outs are category 'A' life threatening events and last year the Seaton First Response team were called out 588 times. The Seaton team last year was in the top two response teams in Devon and Somerset. In comparison the Seaton Fire Engine was called out over 120 times. This year the team are hoping to raise sufficient funds to be able to buy a second full set of emergency equipment which will allow the team to respond from their home addresses rather than from the Fire Station. This will further reduce their call out times. Lion President, Ian Barradale said that the Seaton and District Lions were pleased to help the Seaton First Response team from money raised during their December street collections. Seaton & District Lions host their annual Senior Citizens Lunch. 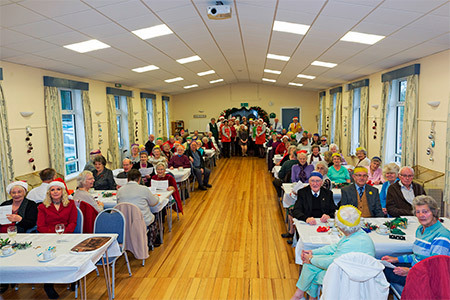 Seaton & District Lions hosted their annual Senior Citizens lunch at Colyford Memorial Hall on Sunday 6th December. This year 78 Senior Citizens enjoyed a three course Christmas dinner all paid for, arranged, served up by the Lions and cooked by Jill Vanderwolf and her kitchen helpers. This year was the 30th year the Lions have been organising the Christmas Turkey dinner although they did hold a dinner for 5 years before this in conjunction with Axminster Lions. 18 Lions together with help from 3 Young Leaders in Service and 4 lovely ladies from Waitrose in Sidmouth all helped serve the meal which started with home made soup followed by a full turkey dinner and Christmas pudding. People came to the lunch from Colyford, Colyton and Seaton to sit down with old and new friends. Once the meal had been served up and cleared away they all sang Christmas Carols led in the singing by Jenny, Laura and Victoria from the Seaton Young Leaders in Service Group. 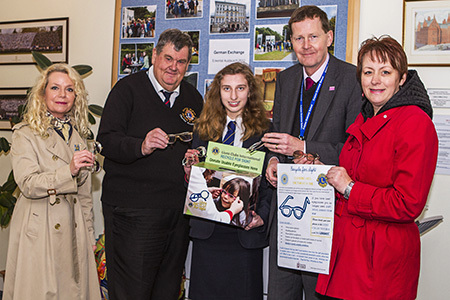 Seaton and District Lions Club Celebrate World Sight Day. Photo shows Lions Club members and Seaton Mayor Tony Woodman wearing their blindfolds and holding white canes. World Sight Day (WSD) is an annual day of awareness held on the second Thursday of October, to focus global attention on blindness and vision impairment. World Sight Day this year was on 8th October 2015.
International White Cane Safety Day is on October 15th and is an opportunity to increase awareness of the white cane traffic safety laws. The white cane was first used in 192 by James Biggs, a photographer from Bristol. Lions Clubs in America adopted the white cane in 1930 and its use quickly spread and is now used worldwide. 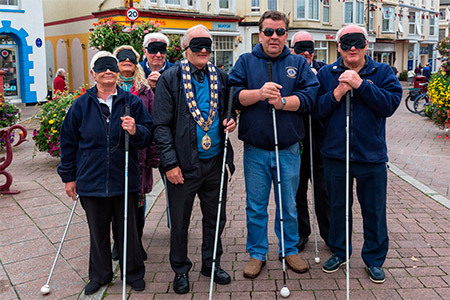 Seaton and District Lions Club celebrated these two events on Saturday by asking people in Seaton on Saturday to don a blindfold and walk through parts of the town centre using a white cane to guide them. This was an effort to raise awareness of the difficulties that blind and partially sighted people face when going about their normal lives. All of those who took part remarked on strangeness of being unable to see and how depending on the white cane to navigate around the streets made each small bump and obstacle disorientating. 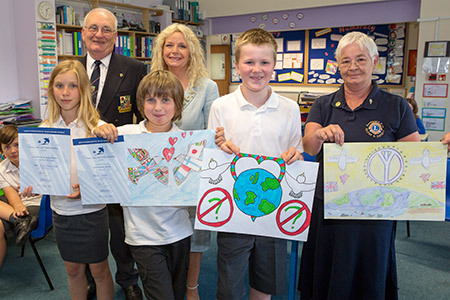 Seaton and District Lions Clubs present Annual Peace Poster Contest Prizes. 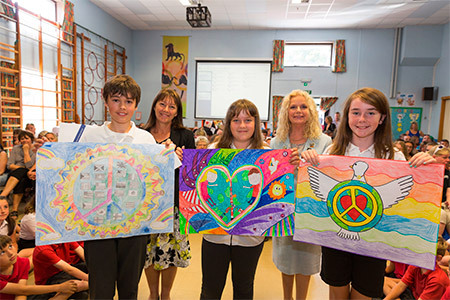 The Seaton and District Lions Club presented their annual Peace Poster prizes this week. Year six children from three local primary schools, Beer, Colyton and Seaton are invited to enter the competition by painting a poster on the years chosen theme. 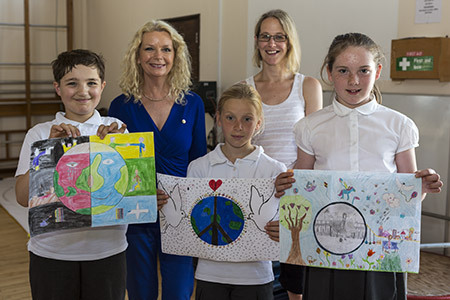 For 2015 the theme chosen by Lions Clubs International is 'Share Peace' and the children are encouraged to think creatively about peace and share their vision with the world. The posters are judged with a winning entry chosen from each school. The winning entry then gets judged against other entries throughout the South West. The winning entry of that round is judged with entries from Great Britain and Ireland. The winner of that round then progresses to the final round which is an International competition involving 24 world wide regions in total. The overall competition winner will win a cash prize of $5000 and a trip to the next Lions International Convention which next year will be held in Japan. The photo shows the three winning entries from Seaton Primary School together with Head of Teaching and Learning, Ms. Kate McFarlane and Lion Janine Barradale who presented gift vouchers to the winners. 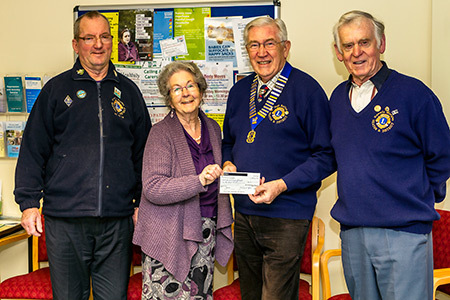 Seaton and District Lions Present Cheque to Hospice South West. 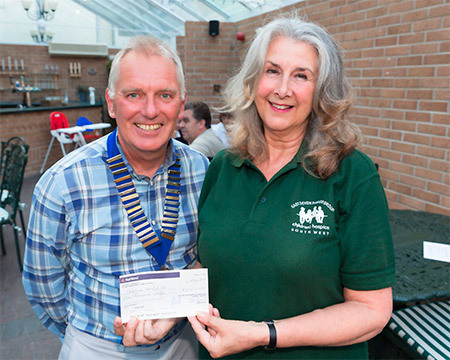 At the August meeting of the Seaton and District Lions Club the Lions donated £1000 to Hospice South West. 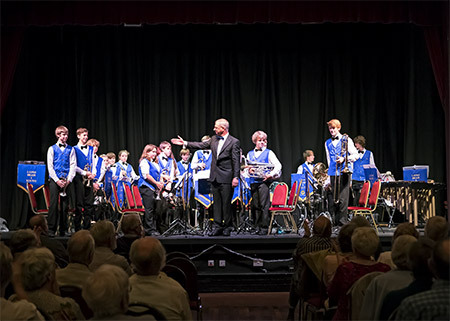 The Lions had raised the money earlier in the year by arranging a concert performed by the Devon Youth Jazz Orchestra at the Gateway in Seaton. The profits from the concert, together with other money raised at different activities was agreed to go towards Children’s Hospice South West. Hospice South West provide care for children with life-limiting conditions and their whole family across the South West. This care starts from the time the child is first diagnosed as having an incurable condition which will mean they will die in childhood into bereavement and beyond for as long as each family member needs them. The nearest Hospice to Seaton is Little Bridge House, which opened in 1995, a beautiful stone built building in North Devon. Little Bridge House is this year celebrating 20 years of helping children and their families. The Lions asked Hospice South West what they wanted to spend the donation on and it was decided the £1000 would go to buy a new Oxygen Concentrator. This machine is used during treatment day and night for some of their young patients whilst they stay at the Hospice. The £1000 donation was accepted from the Lions by Mrs Pauline Leach the local Axe Vale and District co-ordinator for Hospice South West. Hand Over to New Lions President. On July 24th new President Lion Ian Barradale received the chain of office from past President George Mabon. The handover took place at a BBQ arranged by Lion Trever and his wife Jan.
Seaton & District Lions have paid for an emergency defibrillator to be installed in the porch of Seaton Town Hall. The money for the emergency defibrillator was raised from our 2014 Christmas Santa float collection around the streets of Seaton, Colyton, Axmouth & Beer. 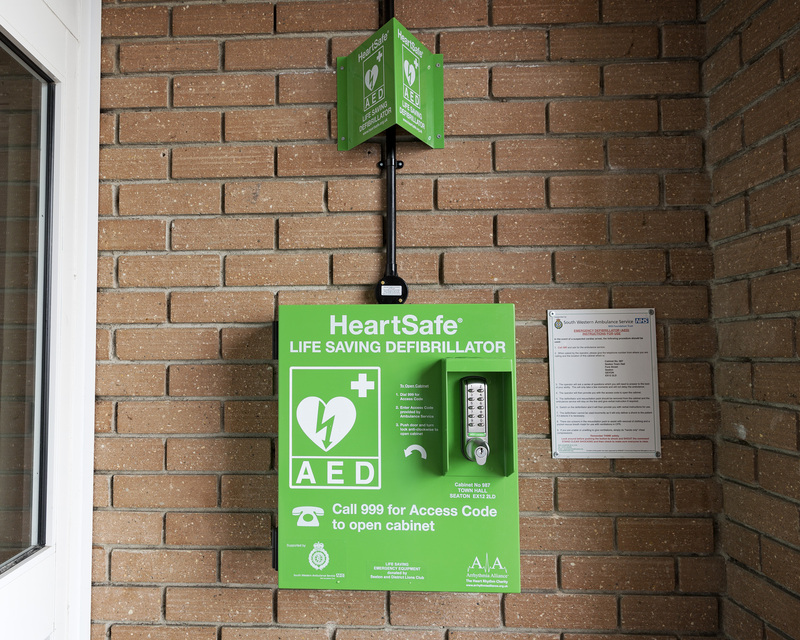 Seaton & District Lions Club will be handing the defibrillator over to the community on the 13th June although it will be commissioned early next week. 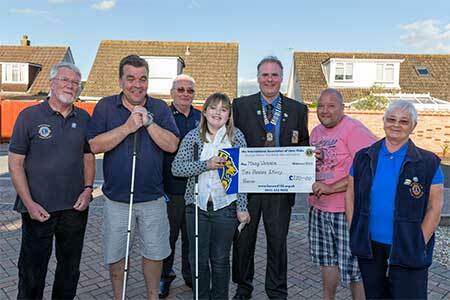 Seaton and District Lions Club have presented the Seaton Visually Impaired Club with a donation of £60. The money will be used to take members of the Visually Impaired Club on a trip to the Royal Oak Fruit Farm in Cotleigh for a Devon Cream Tea. 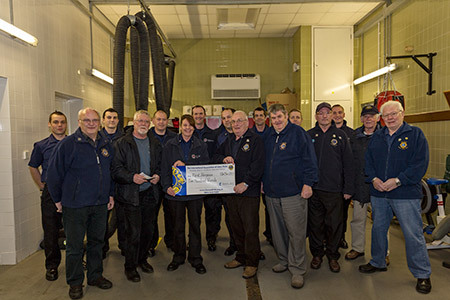 Seaton & District Lions Present Cheque to Seaton Fire fighters. 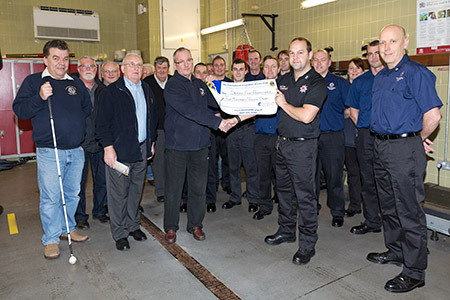 Seaton & District Lions presented a £200 cheque to the Seaton Fire fighters at Seaton Fire station recently. The money was collected last year to be presented towards the first responders team in Seaton. The money will go towards the co-responding fund which buys such items as: Jackets, torches, defibrillator and spine board, with an emphasis this year on a blood pressure monitor and temperature probe. All of this equipment is carried by the Seaton First Response team and is bought with money donated by the public. Seaton Fire Station is manned by the full time Watch Commander, Mike Markham and ten other retained fire crew. Photo shows Valerie Holland, a first response team member being presented with the cheque by Lion Jim Partridge-Hogbin with the Seaton Fir Fighters and members of Seaton & District Lions Club. Seaton & District Lions Club fund raise for CO-OP Charity. 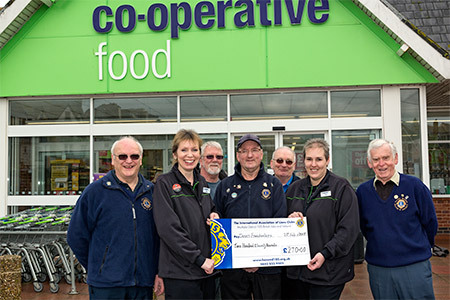 The Seaton & District Lions recently presented a cheque for £270 to the CO-OPs charity of the year, Devon Freewheelers. The money was collected by the Lions just before Christmas on the 23rd December. The Lions spent the day outside of Seaton CO-OP collecting money from the shoppers and passers bye. At the January meeting of the Seaton & District Lions Club it was decided to donate all of the days collection towards the CO-OP's charity of the year the Devon Free Wheelers. photo shows left to right:- Clive Millman, CO-OP Team Leader Maria Holme, Trevor Probert, Fred Paulley, Jim Partridge-Hogbin, Tracey McClellan CO-OP Team Leader and Dennis Morgan. 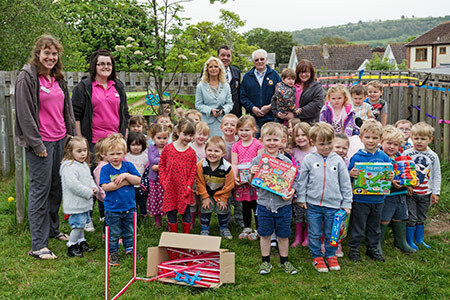 Seaton and District Lions help Colyton Caterpillars. Colyton Caterpillars recently approached Seaton & District Lions Club to help them buy some new equipment for the pre school. The Lions agreed to donate £225.00 towards the cost of a new wood working bench and a outdoor story telling seat all designed to suit the age group of the Colyton Caterpillars. 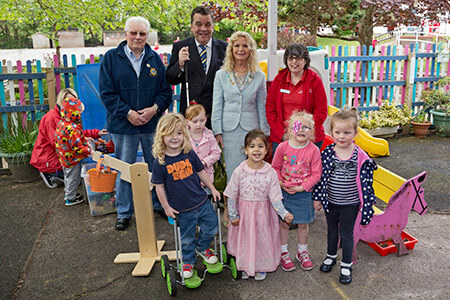 Seaton Lions Help with Disabled Buggy. 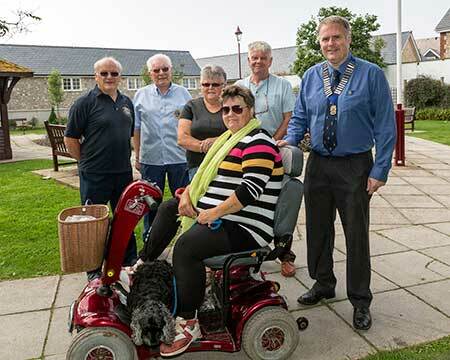 Seaton & District Lions Club recently received a request for help in providing a new disabled buggy from Seaton resident Susan Marsh. Her existing buggy had seen better days and needed substantial repairs to it to make it safe and usable again. After investigation it was decided that it would be best to replace the old buggy with a new one and on Thursday Seaton Lions met up with Susan to see her with her new buggy. 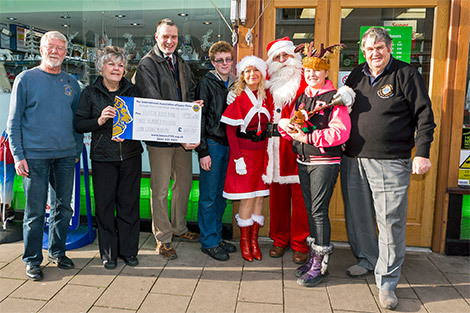 Seaton & District Lions help local girl buy lap top. Mary Waterer whose family live in Seaton is a visually impaired student at New College in Worcester, a national residential school and college for young people aged 11 to 19 who are blind or partially sighted. As part of her 2 year course she needs to buy a new lap top to aid her in her studies of Music and English. She appealed to the Seaton & District Lions Club for help in buying the new lap top and the Seaton Lionsresponded by giving her £250 towards the cost. Photo shows Seaton and District Lions Club members presenting Mary with a cheque for £250. 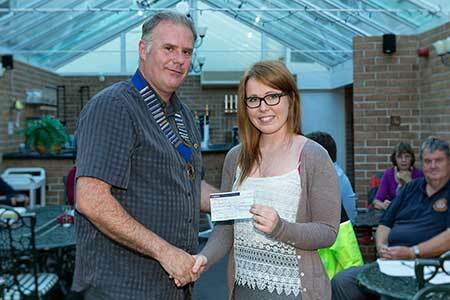 Seaton & District Lions Club give £500 to Abbie Dowse. 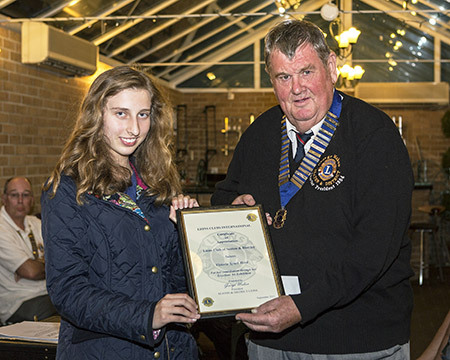 Seaton & District Lions Club recently received a request for help from 18 year old Abbie Dowse to spend 8 months in India as a volunteer helper with Project Trust. Abbie who has been studying A Levels at Axe Valley Community College is due to depart for India in January next year to spend 8 months working with children on one of the educational trusts projects needs to raise £4,870 towards funding her trip. To help her reach her target, Seaton & District Lions Club donated £500 towards her volunteer helper fund. 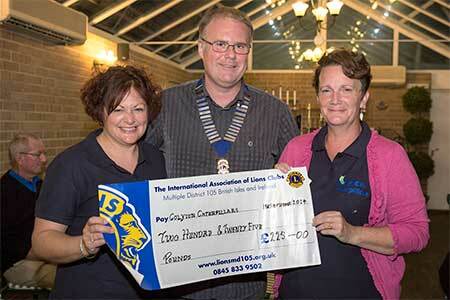 Photo shows Lion President Kevin Frost presenting the cheque to Abbie Dowse. 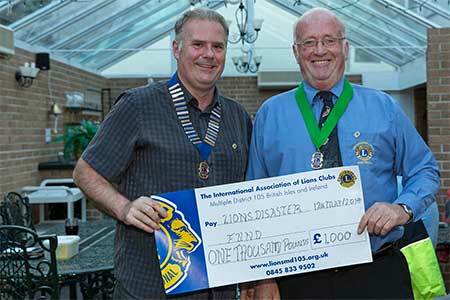 Seaton & District Lions Club donate £1,000.00 to MD105 Disaster Fund. The MD105 Disaster Fund was set up in 2007/2008 to respond to disasters that had happened in Great Britain and Ireland. Since then the Disaster Fund has contributed over £50,000 the latest donation being £11,000 to the South West Lions Clubs appeal towards their Somerset Flood Relief Appeal which ended up at over £40,000. With the MD105 Disaster Fund now depleted Seaton & District Lions Club responded by donating £1,000 to the Fund to enable it to respond to future disasters in Great Britain and Ireland. Photo shows Lion President Kevin Frost with District105sw Second Vice President Fred Broom receiving the presentation cheque. 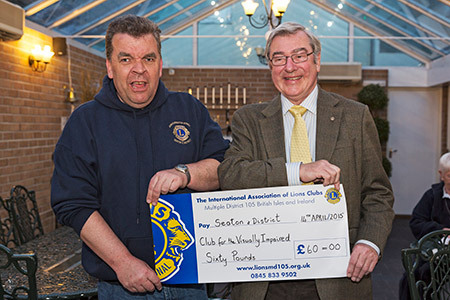 Seaton & District Lions Club donate £350.00 to LIBRA. On Tuesday 12th August Seaton & District Lions Club donated £350.00 to the Lions International Blood Research Appeal – LIBRA. The Lions International Blood Research Appeal (LIBRA) sole purpose is to fund raise for the Haematology Department at King's College Hospital in London. Since they were founded in 1976, they have provided the hospital with vital funds to cover the cost of laboratory space and new state-of-the-art equipment. The donation was from the proceeds of two clocks and an old book auctioned off by Seaton Lion Dave Rickard a determined supporter of LIBRA. Over the past 10 years the total donations to LIBRS from Seaton & District Lions Club has been over £1,600.00. 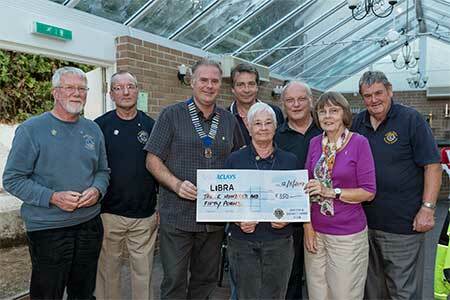 Photo shows Seaton & District Lions with the presentation cheque. Trevor Probert, Fred Paulley, Lion President Kevin Frost, Jerry Parkhouse, Rosemary Partridge-Hogbin, Clive Millman, Pauline Mitchell and George Mabon. 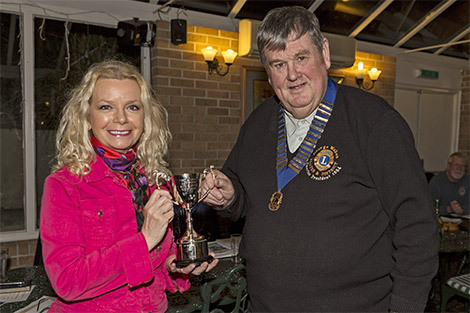 Seaton & District Lions New President. On Sunday 22nd June Seaton & District Lions Club celebrated the start of a new Lionistic year by inaugurating their new Lion President for the next 12 months, Lion Kevin Frost. The presidential handover took place at Winston’s in Harbour Road when out going Lion President George Mabon officially handed over the chain of office to the new President. 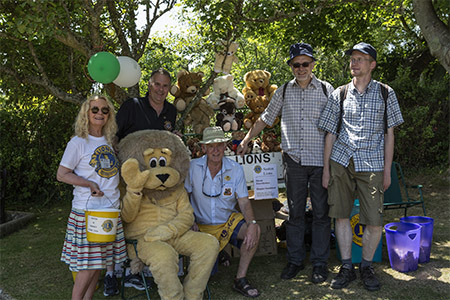 Lion President Kevin Frost is well known locally as a local auctioneer, a keen fund-raiser for the good causes around Seaton and as Chairman of the Seaton Carnival Committee. During his speech on accepting the Presidency, Lion President Kevin said how much he was looking forward to his year as President thanking his fellow Lions for all of their support. He went on to say that by continuing working together as a team, Seaton & District Lions could successfully carry on with their fund raising activities and that he wanted it to be a year of fun filled events and social activities. 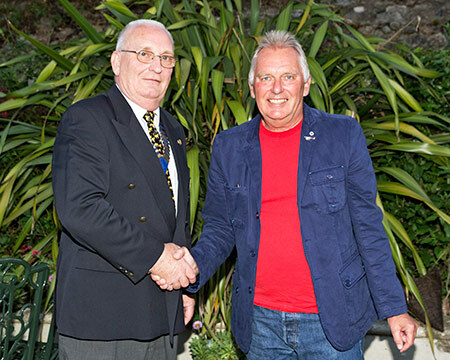 photo shows new Lion President Kevin Frost (left) being congratulated by last years President Lion George Mabon. Seaton & Districts Lions Club Peace Poster Presentations. 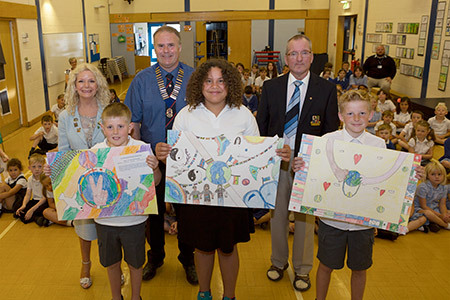 Monday 21st July saw Seaton & District Lions Club members visit the local schools that took part in this years annual Lions Club International Peace Poster Competition. The theme of the 2014-15 Peace Poster Contest is "Peace, Love and Understanding." Students, ages 11, 12 or 13 on November 15, are eligible to participate. This year pupils from Seaton Primary School, Beer Primary School and Colyton Primary School took part competition and members of the Seaton & District Lions Club visited each school to announce the winner and award prizes for the 1st, 2nd and 3rd places. Helga 2nd prize, Poppy 1st prize and Sophie 3rd prize. Bradley 2nd prize, 1st Lenni – Mae, Finley 3rd prize. Lions come to the aid of Seaton Brownies. Seaton & District Lions Club recently received an appeal for help off Linda Carter the Leader of the 2nd Seaton Brownies to buy some new camp beds. The 2nd Seaton Brownies are soon off to their summer camp at the end of August and needed to replace some of their older camp beds for both Brownies and their leaders. Seaton & District Lions Club responded and gave a cheque for £200 which was used to replace 8 beds for Brownies and 6 adult beds for the leaders. This ensures that the 24 strong group of Brownies together with 6 adult leaders all get a good night sleep whilst at summer camp. On Friday 18th July Seaton & District Lions Club gave a presentation cheque of the £200 to the 2nd Seaton Brownies and saw the new beds that had been bought with the money. Photo shows Linda Carter 2nd Brownies Leader receiving the presentation cheque off Lion George Mabon together with the Brownies and other Lions. 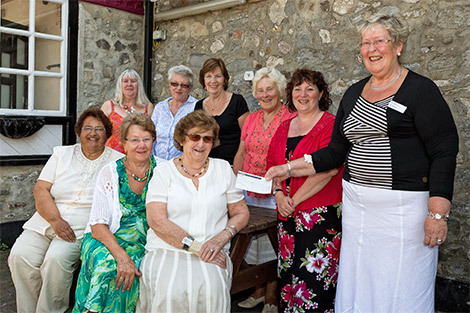 As part of the Seaton & District Lions Presidential handover the Lions ladies made a £200 donation to the South West Hospice appeal to the chosen charity of the out going Lions Ladies President, Hilary Mabon. Eve Deonus accepted the cheque from the Lions Ladies on the behalf of the South West Hospice. The new Lions Lady President is June Frost the wife of new Lions President Kevin Frost. back row left to right Lions Ladies:- Angela Broom, Jan Probert, Carole Norcott, Hilda Morgan. Seated:- Hilary Mabon, Val Rutter and Hazel Evans. Accepting the cheque is Eve Deonus from South West Hospice. Goodbye to Lion John Cook. After many years in Seaton as a member of Seaton and District Lions, PDG Lion John Cook is moving to Reading to be nearer his family. Seaton & District Lions took the opportunity at the handover dinner to wish both John and his wife Marcia well and to say goodbye. 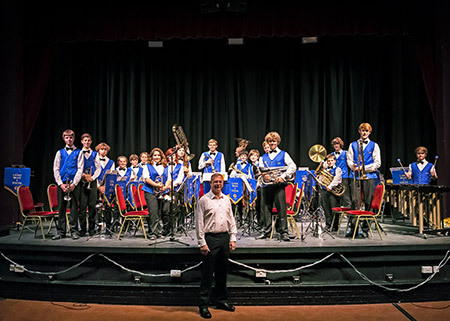 On Friday 13th June the Seaton & District Lions Club presented the Devon Youth Jazz Orchestra in concert at the Gateway in Seaton. In front of an audience of over 150 people the DYJO performed two varied sets of music which included not only big band but swing and blues all played with a jazz interpretation under the direction of their conductor Brian Moore. 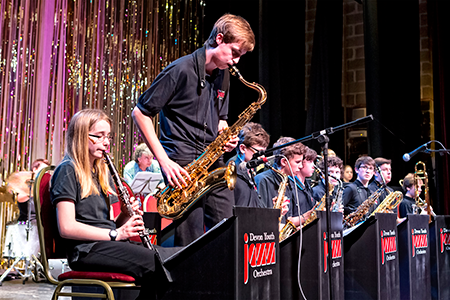 The Devon Youth Jazz Orchestra comprises the best of Devon's youth jazz musicians with the orchestra play at Seaton ages ranging from 11 – 14 years. The Concert was organised by the Seaton & District Lions Club in aid of the country wide Lions Disaster Fund. This fund was set up in 2007 by Lions Clubs of the British Isles and Ireland to respond to national disasters. Recently the Disaster Fund donated £11,000 to an appeal from Lions Clubs of the South West to help flood victims in the Somerset Levels. The total appeal fund has reached a little over £47,000 which is a fantastic amount. Of this £18,500 came from District 105SW Lions Clubs, £17,500 from other Lions Club Districts and £11,000 of grants from MD Disaster funds. In total 54 Lions Clubs have donated of which 27 are in the South West including Seaton & District Lions. It is anticipated that all grants from this appeal to the victims of the recent floods will have been distributed by the end of July. 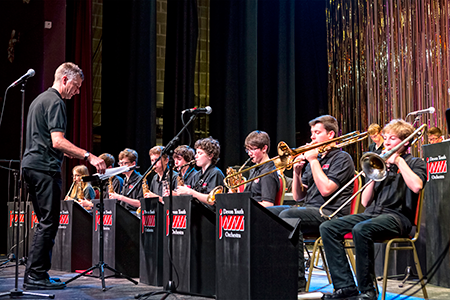 Photo shows the Devon Youth Jazz Orchestra playing at the concert. Seaton & District Lions Club donate £300.00 towards the cost of a new reading scheme at Seaton Primary School. Seaton & District Lions Club recently received a letter from Kay McFarlane a year 6 teacher and head of Teaching & Learning at Seaton Primary School asking for a donation towards the cost of a new reading scheme for the school. The brand new scheme is motivating and exciting designed to raise acheivement levels significantly in reading, comprehension and writing. Seaton & District Lions Club are pleased to support this new reading scheme for Seaton Primary school. Photo shows Lion President George Mabon and Lion Janine Barradale together with Seaton Primary School head girl Poppy and head boy Jacob receiving the presentation cheque. 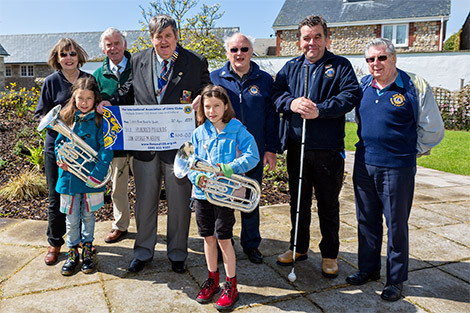 Seaton & District Lions Club make donation to Brass 4 Youth Band. The Seaton & Distinct Lions Club have made a donation to the Brass 4 Youth band to enable them to buy two new instruments for the trainer band. On Saturday 26th April Lion President George Mabon confirmed that Seaton & District Lions Club had donated £600.00 towards the purchase of two new baritone horns for the use of the trainer band of Brass 4 Youth. The cheque was accepted by 9½ year old twins Daisy and Leah Hutchins from Yatton, North Somerset who had travelled down for the day to accept the cheque. 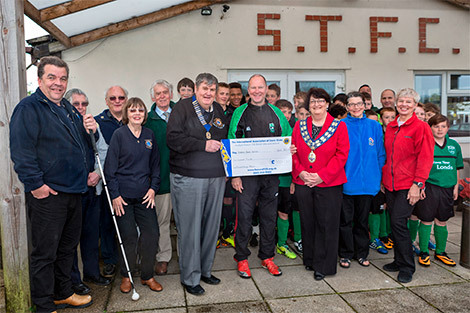 Seaton & District Lions present cheque to Seaton Football Club. Seaton & District Lions Club presented a cheque for £500 to the Youth Section of Seaton Town Football Club to go towards sending two youth teams to Thury Harcourt in France this Summer. The Axe Valley Runners held a Grizzly Presentation Evening on Friday at Winston’s in Seaton to thank all of the clubs, organisations and societies that had helped them make the 2014 Grizzly such a resounding success. The evening was hosted by Rick Wood, Grizzly manpower co-ordinator and Dave Thomas the Race Director. This was the first year of the Grizzly being organised by a new committee and they thanked all who had taken part in the race organisation. Sixty two local organisations had been involved in marshalling the 20 mile long race course involving hundreds of volunteers. 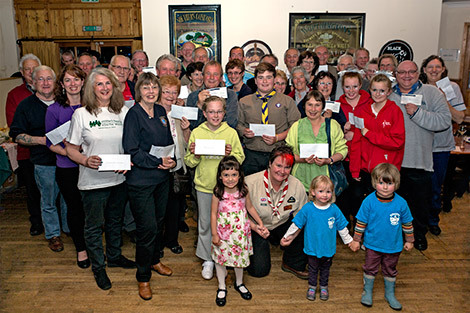 The 2014 Grizzly had raised £32,000 which was being presented by the Axe Valley Runners to the volunteer groups, local and national charities. AVR member Dave Moffitt announced that a further £11,541.00 had been raised by individual runners who had been sponsored to take part in the race. Rick Wood and Dave Thomas then presented all of the volunteer groups including Seaton & District Lions that had helped with the 2014 Grizzly a cheque as a thank you for their support. On Friday two charity cyclists stopped off in Seaton on day 4 of their 12 day cycle ride from St Austell to Dover. 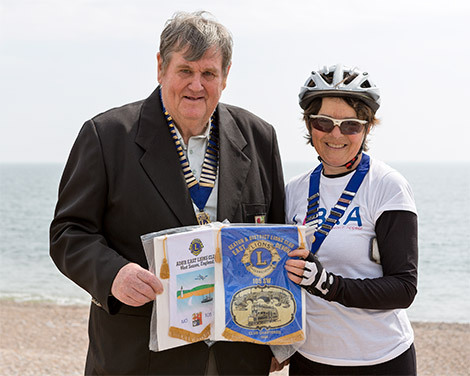 They were greeted by Seaton & District Lions Club President George Mabon who congratulated them on their journey so far and exchanged Lions Club banners with Susan Saunders, President of Adur East Lions Club. With the support of local cyclists and Lions Club members, the two charity cyclists set off on a 12 day challenge from St Austell on Tuesday 22 April 2014. 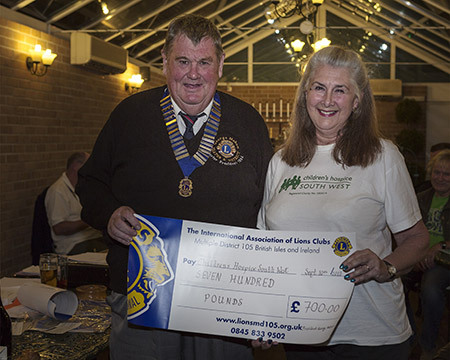 Susan Saunders, President of Adur East Lions Club, and her partner Lion Maurice Allen aim to raise as much as possible for the Lions International Blood Research Appeal (LIBRA) - a charity which helps to tackle blood cancers. The couple, both from Shoreham-by-Sea in Sussex, will cycle more than 420 miles in 12 days. Their challenge began at Saint Austell and ends on 3rd May in Dover. "Their challenge raises funds for LIBRA which is a very worthy cause. The fact that they have chosen to combine their enjoyment in cycling to fundraise makes this even more rewarding." All funds raised will benefit LIBRA which is the only charity in the world that solely raises funds for the Haematology Department at King's College Hospital in London. Funds ensure that the Department is able to develop new and improved treatments for blood cancer patients across the UK. Seaton Lion gets recognised for 10 years of service. Seaton Lion Geoff Connett received recognition of 10 years of service in the Lions at the April meeting of Seaton & District Lions Club. He received a letter thanking him from International Lions President Barry Palmers and a 10 year chevron. 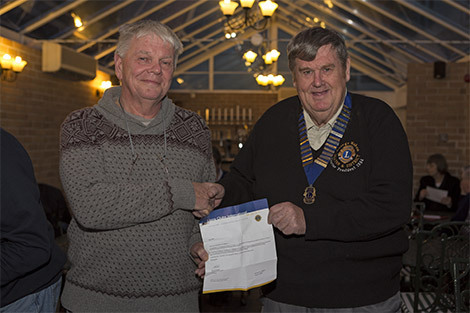 Photo shows Geoff receiving his letter from Lion President George Mabon. Seaton & District Lions present cheque to Marie Curie Daffodil Appeal. Seaton & District Lions Club recently held a collection in the foyer of the Seaton Tesco store as part of this years Marie Curie Great Daffodil Appeal. During the day the Seaton & District Lions team collected a magnificent £438.50p from the generous shoppers at the Seaton store. 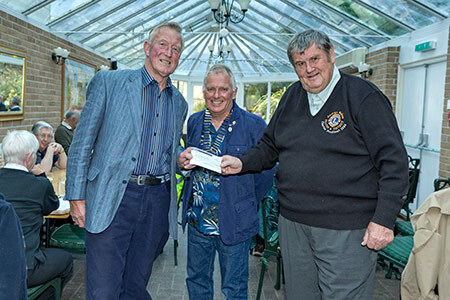 At the April meeting of the Lions, Seaton & District Lions Club presented Sandy Sinclair who represented the Marie Curie Charity with a cheque for £438.50 for the money that had been donated. 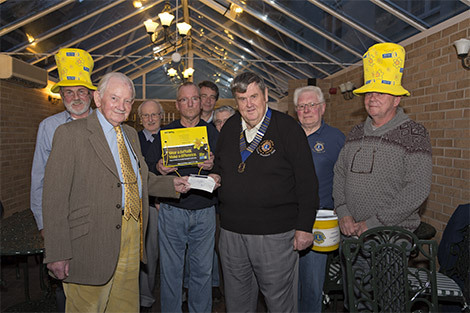 Photo shows Seaton & District Lions with their President George Mabon presenting Sandy Sinclair with a cheque for £438.50 as their part of this years Great Daffodil Appeal. 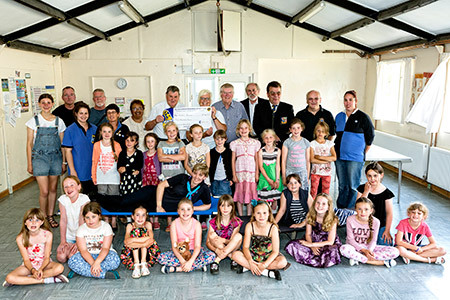 The Seaton and District Lions Celebrate Winning an Award for Young Leaders in Service. At the recent Lions District Convention when Lions Clubs from all over the South West gathered in Torquay the Seaton & District Lions Club were honoured to be presented with the annual Youth Cup for their work with the Seaton Young Leaders in Service. They were judged to have made the biggest contribution for their sponsorship of the seven Seaton Young Leaders in Service who this year received their Gold Awards. Seaton & District Lions Club make a presentation of a cheque for £500 to the Dream- A-Way charity. 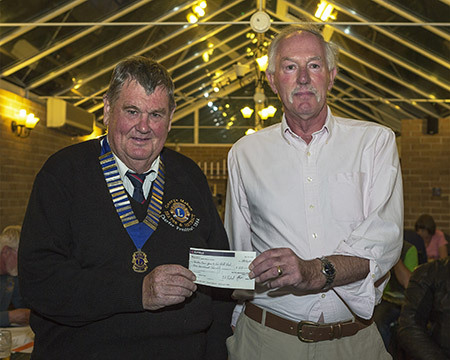 At the Seaton & District Lions Club March meeting Lion President George Mabon made a presentation of a cheque for £500 to Jeff Merrett MBE Chairman of the Dream- A-Way charity. Dream-A-Way's aim is to assist people living in Devon, Cornwall and the Scilly Isles with physical and learning difficulties. They provide holidays and day trips - whether it is fulfilling a lifetime dream, experiencing great opportunities or just having 'time out' from daily routines. People of all ages and from around the South West are helped in every way possible to have a Dream-A-Way holiday. The volunteer committee members use their time to raise money to fund the trips and also actively seek out opportunities to help people throughout the South West. The opportunity for the Dream-A-Way Team and our friends to raise money and help others has always been the driving force behind the charity. What makes this charity so extra special is that the volunteers provide their time and services freely - and that the charity does not incur any administration costs. No persons associated with Dream-A-Way receive any honoraria, payments or expenses for their work. More than 99 % of all funds raised goes straight towards helping others. Dream-A-Way prides itself on giving all the money to funding trips and not spending on overheads or taking any payment or expenses. Over 8,000 people have benefited since our launch in 1993 and in 1999 Dream-A-Way purchased a luxury caravan at the Haven Holiday Park at Devon Cliffs, Sandy Bay, near Exmouth in Devon. In 2010 we purchased our eighth luxury holiday home to help even more people to have a Dream-A-Way holiday. Seaton Young Leaders in Service Awards. On the 22nd January the Seaton Young Leaders in Service were presented with their Gold Awards for each completing more than 100 hours of service in the local community. The Young Leaders in Service initiative is a World wide signature project by Lions Club International to encourage young people to put something back into their local communities. Each young person is required to complete 100 hours of service to the community which is all logged and recorded by their sponsors, Seaton & District Lions Club and Seaton Voice after which the log books are sent off to Lions Clubs International in America to be judged to qualify for the Young Leaders in Service award scheme. 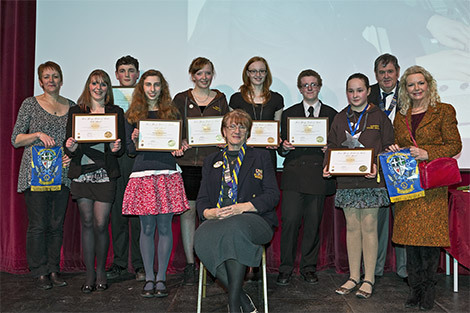 Photo shows Seaton Young Leaders with their Gold Certificates. The District Governor of the South West Lions Clubs, Lion Marianne Warren presented each of the Young Leaders in Service with their Gold Award in front of an audience of over 60 at the Gateway in Seaton Town Hall. The audience was made up of family and friends of the Young Leaders, members of Seaton & District Lions Club, Lion Clubs 105sw District Officers, Seatons Voice, and Seaton Mayor, Gaynor Sedgwick. District Governor, Marianne Warren opened the evening with a short talk on the work of the Lions. How Lions Clubs worked with young people with their Young Leaders in Service Award scheme, Youth Peace Poster competition, Young Ambassador and Youth Exchange visits, not only in this country but throughout the world. She then handed over to Lion Janine Barradale and Seatons Voice Director Carol Manley who introduced each of the Young Leaders in turn explaining to the audience what each of the Young people had achieved in their year of service and how they had all exceeded the 100 hours needed to qualify for the Gold Award. District Governor, Marianne Warren then presented each of the Young Leaders with a Gold Award certificate and a letter of thanks both signed signed by this years Lions Clubs International President, Lion Barry Palmer. A YliS badge, a gift voucher from Seaton & District Lions Club and friendship banner from District Governor, Marianne Warren. A special 'peer group' award was given out to the youngest member of the group Jenny Weber in recognition of the outstanding service she had rendered during the year. The Young Leaders then gave flowers to thank their two sponsors who had guided them through the year, Seaton Voice Director Carol Manley and Janine Barradale from the Seaton & District Lions Club. The final speech was given by Seaton Mayoress, Gaynor Sedgwick who said that Seaton had every reason to be proud of the Young Leaders and what they had achieved. 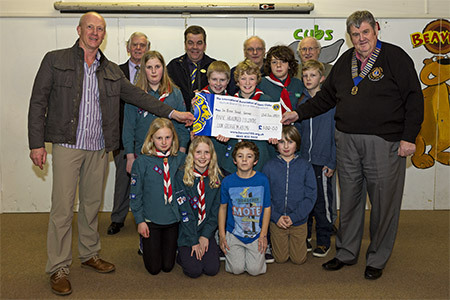 Seaton Lions Present Cheque to 1st Beer Scout Group. Seaton & District Lions Club were pleased to be able to present a cheque for £500 to the 1st Beer Scout Group on Thursday (23rd January) as a contribution towards the cost of refurbishing their scout hut. The Beer Scouts are presently fund-raising to improve the thermal insulation of their Scout Hut in Clapp's Lane, Beer. The hut, whilst currently wind and weatherproof, is of a basic timber construction with metal windows. It has virtually no insulation and what heat generated from the individual heaters rapidly disappears. This does limit some of the activities of the various sections, particularly in the winter months. The Beer Scouts have estimated the cost of the works to be around £6000 and made it the key aim for their fund-raising over the next year. So far, they have managed to raise £2,300 through various schemes such as jumble sales, bag packing etc and with the latest contribution from Seaton & District Lions Club have now reached a total of £2,800 towards the target of £6,000. 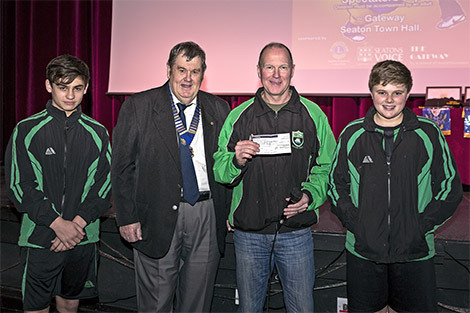 Seaton & District Lions Club have made a £500 cheque presentation to Seaton Town Youth Football Club. After a record breaking Christmas collection season, Seaton & District Lions Club have made a £500 cheque presentation to Seaton Town Youth Football Club. At the Whitsun weekend this year two of the Seaton Town Youth teams will be travelling to Seatons twinned town of Thury- Harcourt in France for matches against their equivalent youth sides. This is an exciting prospect for our youngsters and, at the same time, Seaton Town Youth Football Club hope that it will enhance relations between our two towns. The party of about 30 youngsters, aged 12-14, will be led by Tony Bartlett, manager of the under 14 team and Jamie McCabe, manager of our under 12 team. Some parents of the youngsters will accompany the party. As you would expect, this is quite an expensive venture with a total cost of approximately £4000 and Seaton & District Lions Club are delighted to be able to assist them with a cheque presentation towards this cost. Sunday 8th December was the date of the annual Seaton & District Lions Club Senior Citizen Lunch held once again in Colyford Memorial Hall. 103 lucky guests attended this year for another full three course turkey dinner served up by the Lions and their helpers. This year the Lions were joined by five helpers from Waitrose who have been the main sponsor this year with a donation of £750 towards the cost of paying for the meal and the hire of the hall. Also helping were two of Seaton Young Leaders in Service Laura and Kai Fisher, as well as many of the Seaton & District Lions. The meal was once again cooked by Monica’s Kitchens and her band of assistants and served out to the guests by the Lions and their helpers. The afternoon was rounded off with a round of seasonal carols with Roger accompanying on his electric keyboard before the Lions took many of their guests home. The Seaton & District Lions Club made two cheque presentations on Saturday during their Christmas Table Top Sale. Both were related to the Seaton Food Bank Appeal and were a part of Lion Presidents George Mabon's annual Presidents fund. The total donated was £300.00 with £200 donated directly to the Seaton Food Banks appeal fund and a further £100 donated to the 'Steves News' Londis store in Fore Street, Seaton to be spent in this local store as part of the Food Bank food raising activities. The photo show Revd Simon d'Albertanson receiving the cheque donation on the behalf of the Seaton Food Bank. On Saturday 5th October the Seaton & District Lions Club arranges a concert by the Lions Brass4Youth brass band in Seaton Town Hall. The evening was attended by over 120 people who had not only come from Seaton but from other Lions Clubs to enjoy an evening of varied music. 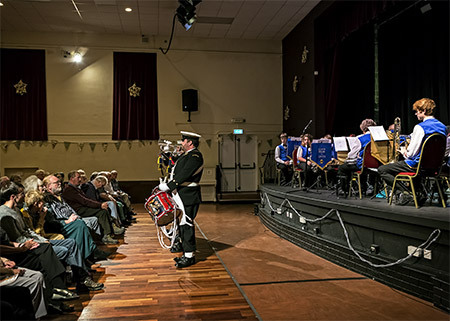 The evening was opened by the Drum & Bugle Corps of the Portland Sea Cadets who paraded through the hall to the front before playing for 15 minutes. The second half started with the 'Final Countdown' before going onto 'My Way' and the amusing 'The Typewriter' which was made popular by the 'Boston Pops Orchestra'. The final numbers of the 'Hootananny' and the 'Floral Dance' had the audience tapping their feet and clapping along. After an encore the evening was finished off with a further march trough and performance by the Portland Sea Cadet Corps of Drums. The Lions Brass4Youth bras band is based in Clevedon North Somerset and consists of 25 young muscicasins aged between 10 and 19 years who are grade 4 and above. Their Musical Director who leads the band is David Hollister. 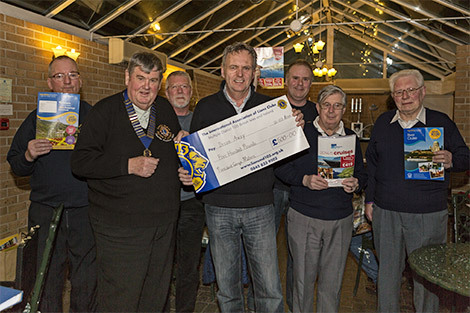 Seaton & District Lions Club YLiS Raises £531 for Lions. Victoria Synek Herd, young local artist and Year 10 student at Colyton Grammar School, has been taking part in the Lions Young Leaders in Service International Award Scheme. The scheme is sponsored by Seaton and District Lions Club in association with 'Seatons Voice' the community group who manage Seaton Town Hall and run a weekly youth club at which the YliS meet. Victoria has recently achieved her International Gold Award for completing well over 100 hours of community work during a 12 month period. Young Leaders are very special young people, who become involved with their communities, giving of their time and any skills they may have and becoming role models for other young people. As part of this YliS scheme, Victoria had the idea of holding a 'solo' art exhibition. She spent many hours of her free time painting for the exhibition, with work loosely based on a Natural Devon theme (including local scenery, fossils, leaves, Devon butterflies, natural landmarks and coastal scenes). 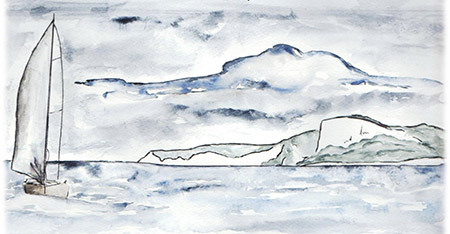 Her paintings are mainly in water colour, with a few in pen & ink. One of Victorias paintings which was mounted and framed. This was auctioned at the exhibition with sealed bids, it sold for £150. Victoria decided to sell her paintings during the exhibition at the Town Hall in Seaton with all proceeds going to Seaton and District Lions Club. 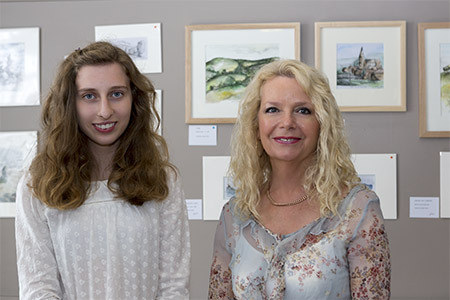 Victoria, together with help from Lion Janine Barradale the Youth Officer for Seaton and District Lions Club and the Seatons Voice Team then co-ordinated the event and created an Arts Café in Seaton Town Hall to showcase and sell her work. The exhibition was a sell out, with many visitors attending to admire her work and buy her paintings. Victoria raised £531 for Seaton and District Lions from the sale of her paintings. at the September meeting of Seaton & District Lions Club. The Seaton & District Lions Club made it an evening of donating to charities at their monthly meeting in September. After their charity fund-raising day at Pecorama in August collecting for Devon Freewheelers and Hospice South West where they raised a total of £700 on the day, the Lions decided to double the money they collected and give both of these two local deserving charities £700 each. At the same meeting The Seaton & District Lions Club made another donation of £100 to the Seaton Town Football Club towards the running of their Youth Teams Service. Seaton & District Lions President George Mabon presenting Pauline Leach from Children’s Hospice South West receiving a cheque for £700 towards Little Bridge House in North Devon. 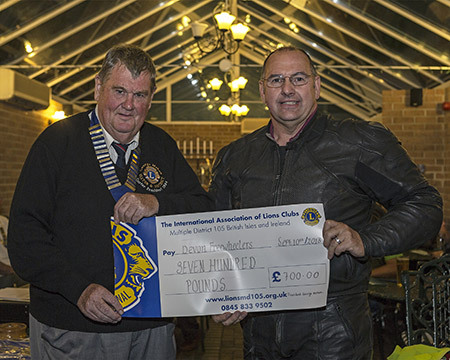 Seaton & District Lions President George Mabon presenting Mick Scaife from the Devon Freewheelers with a cheque for £700 helping to keep this valuable service running which depends solely on donations such as this to operate. Paul Grint from Seaton Town Football Club receiving a cheque for £100 from Lion President George Mabon. Seaton & District Lions Club President George Mabon presenting a cheque for £100 towards LIBRA and receiving a Seaton & District Lions Club banner to take back with him to his own Lions Club in Horsham. LP Tom Osborne so far with his walk for charity has raised £1000 for LIBRA. LP Tom Osborne is being accompanied by Lion Colin Marsh and Lion David Thomas who were also at the meeting. 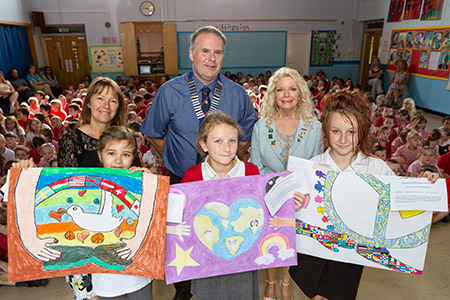 The Seaton & District Lions sponsored three schools and their Young Leaders in Service for this years Lions International Peace Poster competition with the theme of 'Our World, Our Future' The three schools were Beer Cof E, Colyton Primary School and Seaton Primary School. There were three prizes for each school with the winners receiving gift vouchers from the Seaton Lions. The winning posters were judged by local artist Ursala Pratt MBE who made comments about why she had chosen the winning entries. 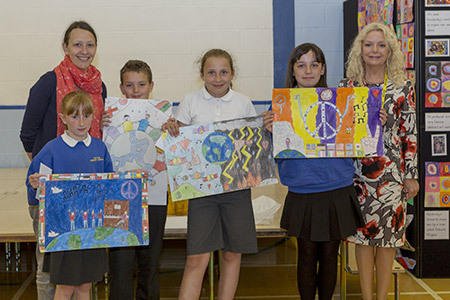 The Colyton Primary School Peace Poster Presentation. Seaton & District Lions at the Pecorama Charities Day. 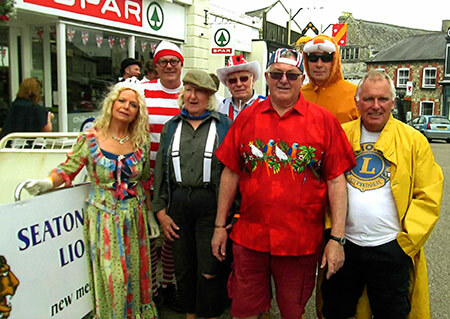 The Seaton & District Lions were able to collect at the annual Pecorama Charities Day on the 14th July. They were collecting on the baehalf of two charities, Hospice South West and Devon Freewheelers. £700 was raised through various activities including a book stall, tombola, teddy bears, face painting and collecting donations .All on one of the hottest days of the summer. 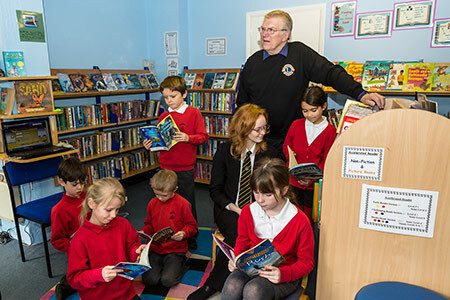 Seaton & District Lions donate £600 towards the cost of purchasing new reading books for Seaton Primary School. Seaton & District Lions recently received a letter from Kay McFarlane a Year 6 teacher and Head of Teaching and Learning at Seaton Primary School asking for £600 towards the cost of purchasing a new reading scheme and books for the school. The brand new reading scheme, called Project Code X is motivating and exciting, designed to boy-friendly with many non-fiction titles written mostly by male authors and proven to raise achievement levels significantly in reading, comprehension and writing. Lions Clubs International President, Wayne Madden is challenging Lions Clubs and the young people they are sponsoring as part of their ' Young Leaders in Service Awards' to participate in the Lions Reading Action Program. This Reading Action Program focuses on increasing literacy and access to learning resources in their local community and through out the world. 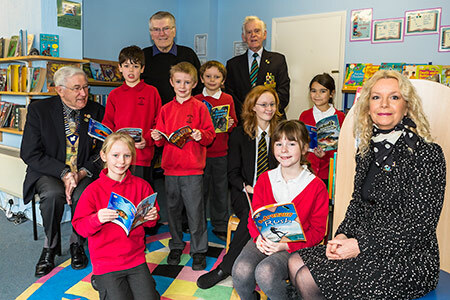 Seaton and District Lions are pleased to support Seaton Primary school and its children by helping towards the cost of this new reading scheme. Some of the Seaton Lions Club with one of the Young Leaders in Service they are sponsoring, visited the school to see some of the new reading books they have helped provide. 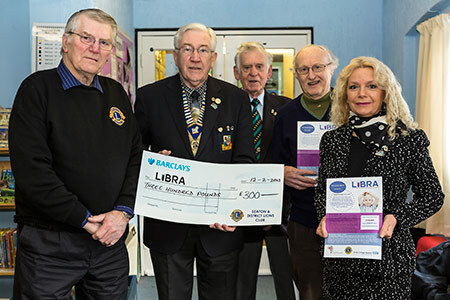 Seaton & District Lions Club have presentedLIBRA with a cheque for £300 towards their work in supporting the Haematology Department at King's College Hospital. This is the sixth donation that the Club has made to date. LIBRA is the Lions International Blood Research Appeal and is dedicated to raising funds for the Haematology Department at King's College Hospital. Blood disorders affect people of all ages and with the support of LIBRA King's is able to provide first class patient care. We raise funds to cover the cost of state-of-the art equipment that is vital in the treatment process. Throughout 2013 goal of LiBRA is to raise £100,000 so that two new items of equipment can be purchased. The specialist machines will be used by the haematology team to develop and trial new treatments for blood cancers including Lymphoma, Leukaemia and Myeloma. Cheque Presentation by Seaton & District Lions Club. Seaton & District Lions Club have presented the Seaton & District Hospital League of Friends with a cheque for £200 towards their work in supporting Seaton Hospital. The money was raised during a fund raising collection by the Lions at the Co-op in Seaton last October when £148.00 was donated by the public and the Lions have made up to £200.00. The Seaton & District Hospital League of Friends is a voluntary organisation which supports the work of Seaton hospital. They are able to provide much needed equipment and comforts for the benefit of patients and staff through the income raised by the work of their volunteers and from donations. Seaton & District Hospital League of Friends was formed in 1984 and received charity status in 1985, before the hospital was built. The hospital was built two years later in 1987 and a contribution was made by the League towards the cost of the Physiotherapy and Occupational Therapy Units. In 1995 an Acute ward was added, paid for by the League. Seaton & District Lions are Getting Santa's Sleigh Ready. Seaton & District Lion are getting ready for their annual Christmas Collection when they will be touring the streets with Father Christmas playing Carols and giving out sweets to boys and girls. The money collected by Father Christmas and his helpers goes towards funding the Lions Senior Citizen's Lunch at Colyford Memorial Hall on the 9th December. 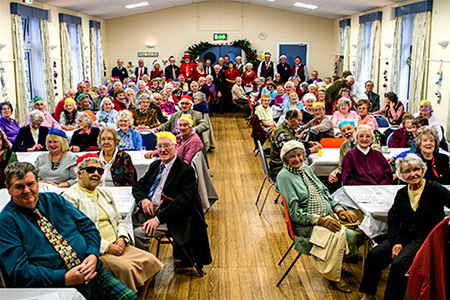 Each year the Lions invite 110 local Senior Citizens to a Christmas dinner which is prepared and cooked by the Lions who then wait on the tables as well as transporting their guests to and from the Colyford Memorial Hall. During the meal the Lions Guests will be entertained by local singer, Mary Bowles. Three Courses of Christmas Cheer. More than 100 senior citizens sat down to a 3-course Christmas lunch courtesy of Seaton & District Lions Club on Sunday 9th December. 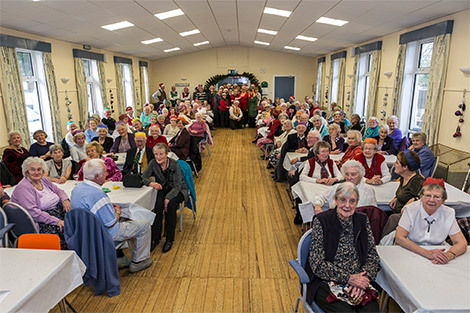 The annual party was held at Colyford Memorial Hall, where entertainment was provided by local singer Mary Bowles who also led the carol singing. Lions Club members served the food which was prepared by Colyton catering firm, Monica's Country Kitchens and also provided transport for the guests. The annual party is paid for with money raised during the Lions Christmas collections. Seaton’s Young Leaders in Service have proved that Seeing really is Believing by working with Seaton Lions and Seatons Voice as part of the Lions worldwide initiative to promote eyeglass recycling. 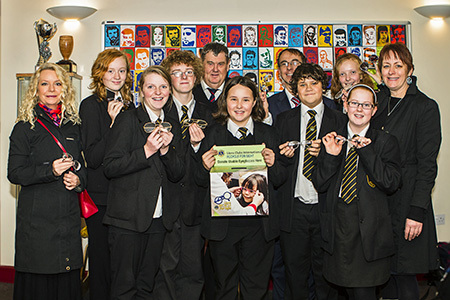 The young volunteers aim to make a difference to benefit children and adults in the developing world by launching a Special Eyeglass Collection in schools. Boxes and supporting posters have been placed in Colyton Grammar School and Axe Valley Community College, encouraging children and staff to scour their homes for old glasses and bring them into school. Once collected the donated glasses are sent to an eyeglass recycling centre where they are sorted. Frames are removed and recycled. The lenses are cleaned and graded, classifying each pair by prescription then put into new frames and prepared for distribution. The recycled glasses are sent on to one of the Lions Eye Camps in developing countries and distributed to both children and adults to help them to see properly again. For the first time in their lives the recipients are able to see clearly, the sky, animals, birds, the faces of their loved ones and helping them to learn to read and write . 400,000 people each year receive recycled eyeglasses. Headteachers from Colyton Grammar Paul Evans and Martin Smith from Axe Valley fully support the scheme and have been delighted that the children have taken the initiative to bring this into their schools. The Young Leaders in Service are sponsored by Seaton and District Lions Club and Seaton’s Voice. Lions Clubs have long been associated with blindness prevention and sight restoration.